England’s highest Test run-scorer Alastair Cook will retire from international cricket after this week’s final Test against India. The opener, 33, has scored 12,254 runs and made 32 centuries in 160 Tests – all England records. “There is nothing left in the tank,” said Cook, who captained his country in a record 59 Tests. The fifth Test of the series, in which England have an unassailable 3-1 lead, starts on Friday at The Oval. Cook is sixth on the all-time list of Test run-scorers and has made a record 11,627 runs as an opener. However, he has struggled this year, averaging 18.62 in 16 innings, and has not scored a fifty in the current series against India. In a statement, Cook said his decision to retire from international cricket had come after “much thought and deliberation over the last few months”. He added: “Although it is a sad day, I can do so with a big smile on my face knowing I have given everything. “The thought of not sharing the dressing room, again, with some of my team-mates was the hardest part of my decision, but I know the timing is right. “I have loved cricket my whole life, from playing in the garden as a child, and will never underestimate how special it is to pull on an England shirt. Cook said he will continue playing county cricket and “can’t wait to get fully involved” with Essex in 2019 after signing a three-year contract. Ex-England captain and Cook’s former coach Graham Gooch: “Alastair has been the rock of England’s batting for the past 12 years and, while we are all sad to see him retire, we must rejoice in what he has done for our country. He is a genuine legend of English cricket. Ex-England captain Alec Stewart on BBC Radio 5 live: “He has timed it perfectly. He will still go out as England’s greatest run-scorer. We won’t fully appreciate him until he has gone. The left-hander made his Test debut at the age of 21, replacing Michael Vaughan against India at Nagpur in 2006, and hit an unbeaten century in the second innings. He missed the third match of that series because of illness, but has made a record 158 consecutive Test appearances since. Cook won four of the seven Ashes series in which he played, scoring 766 runs at an average of 127.66 in 2010-11 as England triumphed in Australia for the first time in 24 years. Cook took over as captain from Andrew Strauss in 2012 and went on to win 24 of his Tests in charge. Only Vaughan has more with 26, although Cook lost a record 22 Tests as skipper. In 2012, Cook led England to their first victory in India for 27 years. He won two Ashes series as captain – at home in 2013 and 2015 – but was whitewashed 5-0 down under in 2013-14. 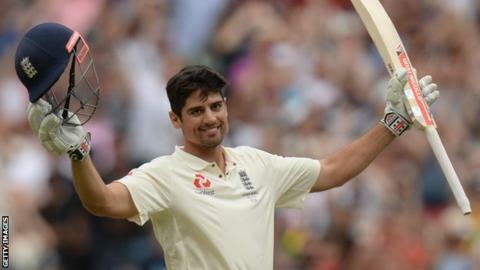 Cook became the first Englishman to reach 10,000 Test runs in 2016, although England lost 4-0 in India that winter and he resigned as captain in February 2017. While he hit 243 against West Indies at Edgbaston last summer, he went through another lean spell before making an unbeaten 244 against Australia in the Boxing Day Test, his fifth double century. He has passed 50 once in 16 innings since then. Cook formed a prodigious opening partnership with Strauss, scoring a combined 4,711 runs in 117 innings between 2006 and 2012 – the most by an England opening pair and third most for any country. Following Strauss’ retirement in 2012, Cook has had 12 different opening partners. Cook also scored 3,204 runs at an average of 36.40 in 92 one-day internationals, but has not played since 2014. He made four Twenty20 appearances for England. 104* v India, Nagpur, 2006: Flown in from West Indies to make his Test debut, Cook followed his first-innings 60 with a brilliant unbeaten century to secure a draw. It was obvious Cook and Test cricket were a perfect match. 235* v Australia, Brisbane, 2010: The first Test of the Ashes against a dominant Australia side. England trailed by 221 on first innings. No matter to Cook, who batted for the best part of two days, taking England to a scarcely believable 517-1 declared and setting the tone for a rare series win down under. 294 v India, Edgbaston, 2011: Cook’s highest Test score, and one central to England’s innings-and-242-run win. That it came after he had managed only 20 runs in his first four innings of the series said everything about Cook’s character. 190 v India, Kolkata, 2012: After scoring 176 and 122 in the first two Tests, captain Cook hit 190 in the third. A 23rd Test hundred made him England’s record centurion and helped England win in India for the first time since 1985. 95 v India, Southampton, 2014: England had been thumped 5-0 in Australia. They had just lost at home to Sri Lanka. Cook had not scored a century in 27 innings. Calls for him to stand down were growing louder by the day. He may not have made it to three figures, but he received a standing ovation for playing what he claimed was the most pressurised innings of his career. England won the series and he remained as skipper. 263 v Pakistan, Abu Dhabi, 2015: If ever an innings defined Cook’s career, this is it. Showing all his fabled concentration and patience, Cook batted for almost 14 hours in the desert heat – the third longest Test innings in history. Only bad light prevented England from pulling off a remarkable victory.